Crude tin, lead and bismuth are purified via liquation. In this process, the impure metal is positioned at the top of a sloping hearth maintained at a temperature slightly above the melting point of the metal. The metal melts and flows down the inclined hearth to a well leaving behind the solid impurities. Metals having low boiling points, like zinc, cadmium and mercury can be purified through distillation. The distillation is generally carried out under reduced pressure to allow boiling of the metal at lower temperature. Therefore, 99.95% pure copper is obtained in this procedure. The more reactive metals like iron that are present in the crude copper, are as well oxidized at anode and pass to the solution. The voltage is so adjusted that they are not reduced at cathode and therefore remain in solution. The less reactive metals like silver, gold and platinum if present, are not oxidized. As the copper anode dissolves, they fall to the bottom of the cell from where they are recovered as a precious anode mud. This process is employed to get metals of very high purity. The fundamental principle involved in this process is alike to the fractional crystallization. A small heater is utilized to heat a bar of the impure metal. The heater melts a small band of metal as it is slowly moved all along the rod. As small bands of metal are therefore melted sequentially, the pure metal crystallizes out of the melt, whereas impurities pass to the adjacent molten zone. The impurities therefore collect at the end of the bar. This end can be cut off and eliminated. High grade germanium and silicon are obtained via purifying them by zone refining (figure shown below). 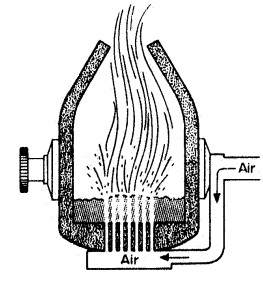 Parke method for refining the lead, which is as well a concentration method for silver, relies on the selective dissolution of silver in molten zinc. A small amount of zinc, 1-2% is added to molten lead that comprise silver as an impurity. Silver is much more soluble in zinc than in lead; lead and zinc are insoluble in one other. Therefore, most of the silver concentrates in zinc that comes to the top of molten lead. The zinc layer solidifies first on cooling; it is eliminated and silver is obtained via distilling off zinc, which is collected and utilized over and over again. This process is mainly based on the thermal decomposition of a volatile metal compound such as an iodide. In this process, first a metal iodide is made by direct reaction of iodine and the metal to be purified at a temperature of around 475 to 675 K in an evacuated vessel. The vapors of metal iodide, therefore formed are heated strongly on a tungsten or tantalum filament at around 1300 to 1000 K. The metal iodide decomposes to yield the pure metal, as in the case of zirconium. The regenerated iodine is utilized over and over again. This method is extremely expensive and is used for the preparation of limited amounts of extremely pure metals for special uses. Titanium, which constitutes 0.63% of the earth's crust, is the 9th most plentiful element. Titanium has numerous useful properties. It is as strong as steel, however only around 60% as dense as steel. It is as well highly resistant to corrosion. Main uses of titanium are in aircraft industry for the production of both engines and airframes. It is as well broadly employed in chemical processing and marine equipment. Magnesium chloride and surplus of magnesium are eliminated by leaching by water and dilute hydrochloric acid leaving behind the titanium sponge. Titanium sponge after grinding and cleaning by aqua regia is melted under argon or vacuum and cast to ingots. In place of magnesium, sodium can as well utilize as a reducing agent in this method. Iron is the second richest metal, aluminium being the first, comprising 5.1% of the earth's crust. Haematite, Fe2O3, having 60-64% of iron is the most significant ore of iron. Other ores of iron are magnetite, Fe3O4, limonite, Fe2O3.3H2O and siderite, FeCO3. Iron pyrites, FeS2 that takes place in abundance is not employed as a source of iron due to the difficulty in removing sulphur. In the iron ore, the main impurities are of silica and alumina. To take away these, lime stone is utilized as a flux. The calcined or roasted ore is then smelted, that is, reduced with carbon, in the presence of lime stone flux. 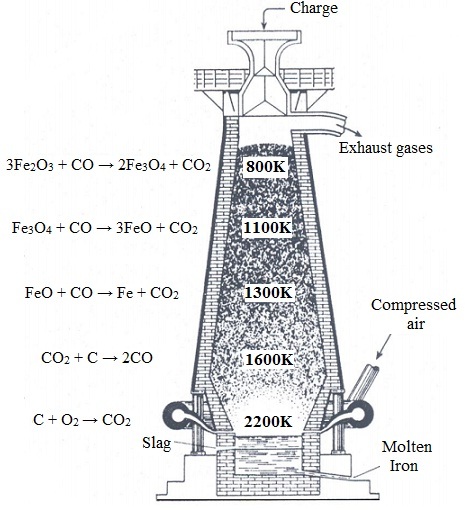 Smelting is completed in a blast furnace as shown in the figure given below. A modern blast furnace is a tall vertical furnace of around 30 metre high and 9-10 meters in diameter at its broadest part. It is designed to take care of volume changes, to allow sufficient time for the chemical reactions to be fulfilled and to facilitate separation of slag from the molten metal. The outer structure of furnace is made up from thick steel plates which are lined with fireclay refractory. The furnace at its base is given with (a) small pipes known as tuyeres via which hot air is blown, (b) a tapping hole via which molten metal can be withdrawn and (c) a slag hole via which slag flows out. At the top, the furnace is given with a cup and cone arrangement for introducing charge that is beginning materials in the furnace. Iron produced is in the solid state up to this temperature. It is porous and is termed as spongy iron. However as the spongy iron drops down further via the hotter parts of the finance, where temperature is approximately 1600 K, it melts, absorbs some carbon, phosphorus, sulphur, silicon and manganese, and collects at the bottom of the furnace. Slag being lighter floats on top of the molten iron. The molten iron withdrawn from the furnace is known as pig iron. The molten pig iron can be poured into moulds to produce cast iron. The composition of pig iron or cast iron differs broadly, however on an average it consists of 92-95% Fe, 3-4.5% C, 1-4% Si, 0.1-2% P, 0.2-1.5% Mn and 0.05-0.1% S. Cast iron melts at 1473 K. Because of the presence of impurities, cast iron is hard and brittle. It is so hard that it can't be welded and it is so brittle that it can't be shaped into articles via hammering, pressing or rolling. Cast iron is quite not expensive and is utilized for making drain pipes, fire-grates, railway sleepers, radiators, lamp posts and so on, where economy is more significant than strength. Wrought iron is the purest form of iron having 0.10-0.25% carbon and impurities of Si, P, S and Mn not more than 0.3%. This is made up by heating pig iron in a reverberatory furnace lined with haematite. Haematite oxidizes C, Si, P, S and Mn to CO, SiO2, P2O5, SO2 and MnO, correspondingly. Therefore MnO combines with SiO2 to form a slag of MnSiO3 and so does Fe2O3 with P2O5 to provide a slag of FePO4. Wrought iron is soft and malleable however very tough. This can be simply welded and forged. Its melting point is around 1773 K and is resistant to corrosion. It is employed to make anchors, wires, bolls, chains and agricultural implements. Owing to its high cost it has been swapped by steel. a) Pentlandite: A nickel and iron sulphide, (Ni, Fe)9S8, having around1.5% nickel. It is found mostly in Sudbury, Canada. This is as well known as Sudbury ore.
b) Garnierite: A double silicate of nickel and magnesium, (Ni, Mg)6S14O10(OH)8 having upto 8% nickel. c) Pyrrhotite: An iron mineral, FenSn+1, as well consists of 3-5% nickel. Pentlandite is the main principal ore of nickel. The metallurgy of nickel comprises several complex steps however the fundamental principle is to change nickel sulphide to nickel oxide and then reduce it by water gas to get the metal. 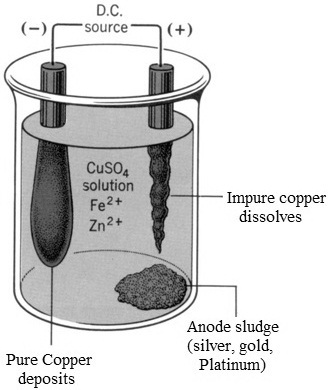 Crude nickel having iron and copper as impurities is purified through Mond process. Copper is found in both the native and also the combined slate. Native copper is found in USA, Mexico, USSR and China. Native copper is around 99.9% pure; however it is merely a minor source of the metal. In the combined state, copper is mainly found as the sulphide, oxide or carbonate ore. Copper takes place as sulphide in chalcopyrites or copper pyrites, CuFeS2 and in chalcocite or copper glance, Cu2S. The oxide ores of copper are cuprite or Ruby copper, Cu2O and malachite, Cu(OH)2.CuCO3. Copper pyrites is the major ore of copper. Workable deposits of copper ore take place in Khetri copper belt in Rajasthan and Mosabani and Rakha mines in Bihar. The copper therefore obtained is known as blister copper as bubbles of escaping SO2 throughout cooling give it a blister like appearance. Blister copper is around 99.0% pure and is employed as such for many purposes. Metals encompass a property of combining by other metals to form alloys. An alloy might be stated as a solid which is made by a combination of two or more metallic elements, however it itself consists of metallic properties. Most of the alloys are solid solutions. For illustration, brass an alloy of copper and zinc is a solid solution of zinc in copper. In brass some of the copper atoms of face-centered cubic lattice are arbitrarily substituted via zinc atoms. Likewise, bronze an alloy of copper and tin is a solid solution of tin in copper. However not all alloys are solid solutions. Some of the alloys like bismuth-cadmium alloys are heterogeneous mixtures having tiny crystals of the constituent metals. Others like MgCu2, are intermetallic compounds which contain metals combined in the definite proportions. The main aim of making alloys is to impart some desirable properties to a metal. For illustration, gold is too soft for making jewellery. Thus, to make it hard, it is alloyed with copper. Solder, an alloy of tin and lead, comprises of a melting point lower than that of both of its constituents. Pure iron is soft, ductile and it is simply corroded. Stainless steel, an alloy of iron, chromium, nickel and carbon is hard, tough and highly resistant to corrosion.